Despite the doom and gloom and the chronic cynicism of Kathmandu, there are many who are quietly building a better Nepal. You don’t hear much about them in the media because they shun the public glare. In this edition of Nepali Times we profile a small sample of individual Nepalis who have shown through dedication and determination that it is possible to build a better future for this country. There is a young woman who decided to leave an academic career in the United States, and returned home to Nepal to serve through politics. A Muslim woman from Nepalganj refuses to be a token human rights activist. A public interest litigation lawyer gave up his passion for singing to pursue the corrupt. A honest policeman cleaned up football and restored respect to Nepal’s national team. A journalist who struggled against a male-dominated profession and patriarchy to reform the Election Commission. There are many more Nepalis across the length and breadth of this land for whom the common denominator is the quiet satisfaction of knowing that they have given all they can to their communities and their nation. What started as an anti-corruption protest movement led by young, educated Nepali professionals transformed itself into a political party in the 2013 election. Since its inception, Bibeksheel Nepali has been steadily working to build an image of an alternative political party that is not led by hardened politicians, but by average Nepalis with a vision for the country and looking for and being a part of change. There are three elections planned for 2017, and if they happen (a big ‘if’) Bibeksheel hopes to secure seats in village, district and municipal councils including in Kathmandu. Bibeksheel means ‘conscientious’ and has always maintained that it does not compete with other political parties but strives to change the political culture of Nepal. Anusa Thapa, a 31-year-old PhD, is representative of the kind of young people Bibeksheel has managed to draw in. Thapa is CEO of the party, the only political party in Nepal that has a Chief Executive Officer. “Even though I was never directly associated with politics, I always wanted to serve the people of Nepal. So my dreams from when I was little were always political in nature,” says Thapa, who was born and raised in Singapore and returned to Nepal after completing her doctorate in life sciences from the University of Virginia in 2014. The CEO’s job is to lead the party’s operations team so that the leaders can focus on strategy and planning out elections. Even if it doesn’t win any seats in upcoming elections, all eyes will be on the party to show if it maintains transparency -- a value its members place high in their agenda. As CEO, Thapa heads the management of the party and is responsible for ensuring that the party runs like a well-oiled engine. After completing her education, Thapa realised that making a difference in the field of her studies would take a long time. So when she got an opportunity to work with Bibeksheel Nepali, the change she wanted to see in Nepal seemed clear. “I felt that if people like them and I could get together then the change for the country that I envisioned would come faster,” says Thapa. She joined Bibeksheel Nepali as a volunteer after the second earthquake in May last year. A month later she was hired as International Coordinator and Alliance Building Officer. Ten months later, the party’s Central Committee through the Executive Board headhunted and appointed her as the CEO of the party. Thapa’s new year resolution for 2017 is to improve her Nepali language skills, and work harder as an independent, successful woman. She is especially interested in contributing to Nepal’s education, since it was the opportunity she got in schools abroad that opened doors for her. 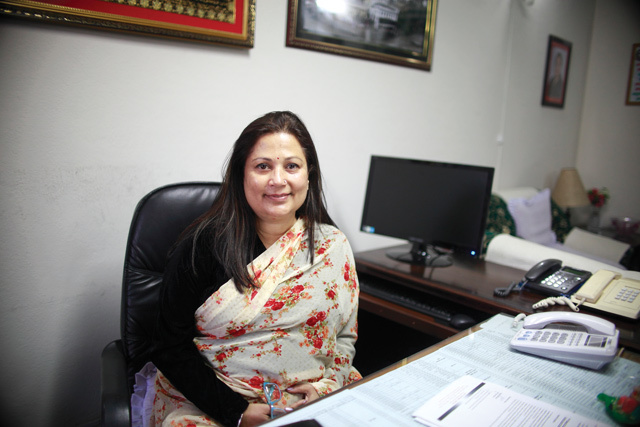 It has been just two years since her appointment as a member of the National Human Rights Commission (NHRC), and Mohna Ansari has already proved that she is not just a token Muslim woman in office. Early this year, Ansari made headlines by demanding a probe into the killings of 55 people during the Madhes unrest during the UN’s Universal Periodic Review (UPR) meeting in Geneva. Her bold statement angered Prime Minister KP Oli who reprimanded her for tarnishing Nepal’s image at an international forum. Ansari remains unapologetic about her statement, and insists that the state used excessive force to quell protests in the Tarai in 2015. “No one was shot at below waist, and some were even shot in the head,” she said. The observations were from Ansari’s own visit to the Tarai last year to investigate the violence that followed the promulgation of the Constitution. She was equally critical of the lynching of eight policemen and shooting of a child by protesters in Kailali on 25 August 2015. Today, amidst the political gridlock in Kathmandu with the main opposition UML rejecting the second amendment to the constitution and Madhesi parties threatening to launch a fresh agitation, Ansari’s role of human rights commissioner will be even more critical in 2017. Before the NHRC, Ansari served a full term as a member of the National Women Commission (NWC), and contributed to drafting of laws against dowry and witchcraft. She is firmly convinced social awareness is more important than laws to combat these social maladies. “Our political leaders themselves perpetuate the dowry system, just look at the recent disclosure of assets of our male ministers, they have all boasted about property they received from their wives,” Ansari pointed out. 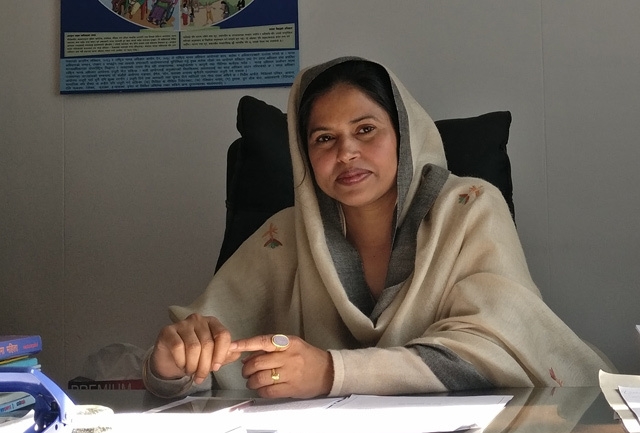 Born to a Muslim family in Nepalganj where girls needed to wear veils and were not allowed to study in the same classroom with boys, Ansari faced social and cultural barriers at every step, but that did not deter her from becoming Nepal’s first female Muslim attorney. “My non-Muslim neighbours treated me like an untouchable, my in-laws wanted me to wear a veil after marriage,” she recalls, adding that she never gave up, and continued to study after giving birth to two children. Ansari came to Kathmandu after being asked by the National Inclusion Commission to write a position paper on Muslim women, recommending ways to uplift their socio-economic status. She then got a bigger responsibility as a NWC member. Chief Justice Sushila Karki has publicly spoken about how her colleagues passed gender-insensitive comments within the Supreme Court chamber. Ansari is also often among male commissioners who are supposed to be more sensitive about gender issues. But even here, she often feels subtle harassment. While the Big Three parties are bickering over the amendment and Parliament is stalled, elections are looking more and more iffy. But that doesn’t mean Election Commissioner Ila Sharma can sit back and relax. Political indecisiveness and instability have made Sharma’s job at the Commission a constant challenge, but the former journalist is not one to give up. Her perseverance and determination to maintain the integrity and preparedness of the Election Commission keeps her going. “Management-wise we are ready from our side,” said Sharma confidently. This is her second election after her appointment in March 2013. Sharma is relentlessly lobbying with Members of Parliament for important reforms, such as public funding for elections and changes in the Political Parties Registration Act. The government removed some of these provisions from the draft election bill, but she is determined to reinsert them through MPs every time it is taken out. “Whatever we do, we do for the people and democracy,” said Sharma who is coordinating committees on legal drafting, political party relations, media, gender and inclusion, voter rolls, voter education and training. Sharma’s determination and focus comes from her previous career as a reporter in Rising Nepal and the constant sidelining of women journalists. “I was treated like a wall flower and was assigned softer stories when my real interest was politics and economics,” Sharma recalls, adding that the leadership ability of women is still being underestimated today. Her grit and passion paid off, and it was only when she started writing editorials that her colleagues started viewing her in a different light. She needed all the personal strength she could muster when her husband was killed during the war. One of her first initiatives after joining the Election Commission in 2013 was to introduce a gender monitoring system in elections. For the upcoming elections, she has introduced a gender responsive budget and has largely focused on women and youth when it comes to voter education. Even in the draft bill, Sharma has been pushing for a 50 per cent women representation in the local level. “Women are ready for local leadership, and there will be a critical mass of women leaders who will be capable of taking on national-level leadership,” Sharma said. In order for the Commission to take a more proactive approach in the runup to the elections, Sharma has also been working on her pet project called the ‘Knowledge Initiative’. She feels the Commission’s duties transcend just holding elections, and the project takes into consideration engaging with the press, civil society and emphasising voter education. Ahead of the Supreme Court hearing this week on whether Lokman Singh Karki’s appointment as the head of the anti-corruption watchdog (CIAA) was legal, advocate Om Prakash Aryal appeared a bit worried. Aryal is one of the key plaintiffs preparing to present evidence and arguments at the hearing to prove why Karki was not qualified for the job, but that is not why he is worried. After making headlines by bravely standing up to Karki’s parallel regime by taking him to court in 2016, Aryal thinks powerful interest groups want to manipulate him. He is trying hard to avoid taking the bait. When Karki was accused of abusing his power as Chief Secretary during the 2006 Democracy Movement, Aryal was a lawyer at the National Human Rights Commission. He witnessed how Karki abused his authority to threaten pro-democracy activists, carry out a witch-hunt in the bureaucracy and muzzle media. Aryal was therefore aghast when Karki was nominated to head the Commission for the Investigation of Abuse of Authority (CIAA) in 2013, and filed a writ against his appointment. His petition argued that Karki was disqualified for public service, and lacked requisite experience and moral character to head a constitutional body. His petition was quashed by a pliant court and Karki was confirmed. But when Chief Justice Sushila Karki reopened the case against Karki in 2016, the public interest litigator came into the spotlight again. Karki has already been suspended after an impeachment motion was filed against him in parliament in October. Karki now faces five legal cases, and four of them were filed by Aryal himself. Karki had to appear himself in one of the cases about his alleged attempt to disrupt court proceedings. “People say I brought Karki down, but he has been brought down by his own arrogance, and disregard for the rule of law,” says Aryal, who is also vocal about judicial corruption and politicisation of the judiciary. In 2012, when the then-Chief Justice Khilraj Regmi was named caretaker Prime Minister, Aryal had argued that it violated the doctrine of the separation of powers in a democracy. “Regmi set a dangerous precedent, it told other justices that they too can have political ambitions, and this does not bode well for the future,” he says. Aryal came from Gulmi to Kathmandu to be a singer, but ended up being a lawyer instead. 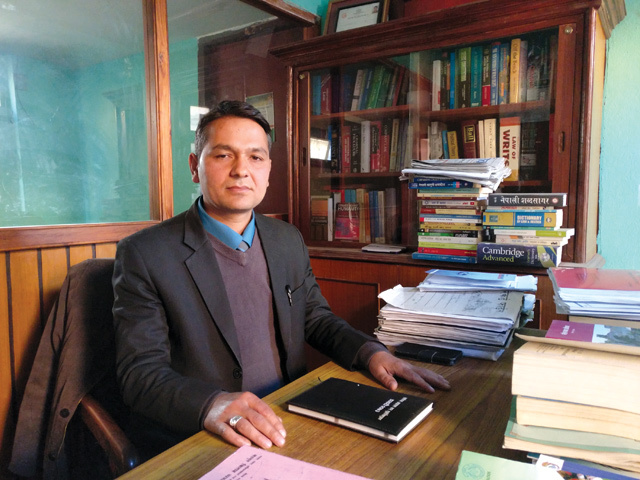 He knew Khilraj Regmi personally, but that did not deter him from taking a stance. He has never met Lokman Singh Karki, but says he will look him straight in the eye if they meet. 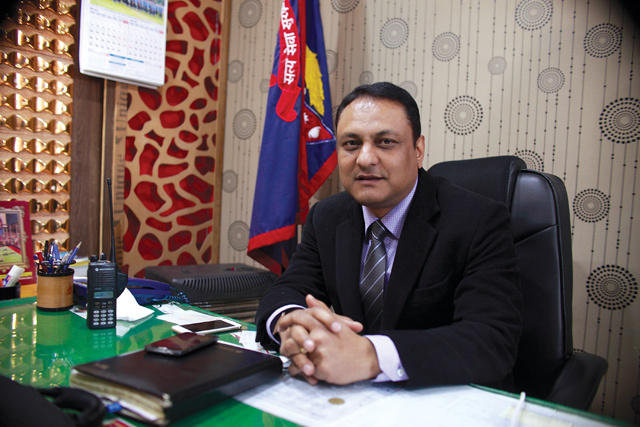 As an avid sports aficionado Senior Superintendent of Police Sarbendra Khanal knew about Nepal’s football history. What bothered him was that instead of getting better, the performance of the national team was declining. Nepal time and again failed to score during matches while mysteriously conceding multiple goals. Khanal had heard of match fixing scandals, and his intuition told him something wasn’t right in Nepal’s national team. After three months of secret investigation exposed a nexus of corruption in 2015, Nepal saw its biggest sports scandal in history. Five national team players including captain Sagar Thapa, vice-captain Sandeep Rai and goalkeeper Ritesh Thapa along with two former national players Anjan KC and Bikash Singh Chhetri were arrested on charges of match fixing in national and international games. Khanal and his team uncovered evidence that showed activities and transactions with links to international convicted fixers and even attempts at corrupting under-19 players who would have been paid to lose games. “Other crimes affect a single person or community but here was a crime that affected the entire nation. Their activities affected the nation’s image and pride so it was important to get the key figures who were involved,” says Khanal. “It takes a lot of courage to translate the findings of an investigation into reality,” says Khanal, who was initially worried that if the team’s performance receded after the arrests, there may be a public backlash. By the beginning of 2016 the Nepal team started playing much better. It defeated Bahrain to lift the Bangabandhu Cup in January and in February the team defeated India to win the gold medal in the South Asian Games men’s football after 23 years. The crowning glory came in November when Nepal defeated Macau to win the AFC Solidarity Cup. Following the performance of the team many have taken to social media to hail Khanal as a hero for his investigation that cleaned up football in Nepal. “I always had a sense of responsibility to do something for the nation and the people and that is what drives me. I have to fulfill my responsibilities to make people’s lives better,” says Khanal, who is known for his integrity and hard work. Khanal led the team that booked former Deputy Superintendent of Police Jagadish Chand in connection with the murder of Jamim Shah, the chairman of Spacetime Network. His team from the Metropolitan Police Crime Division (MPCD) also solved the Badikhel murder mystery after 12 years where five members of the same family had been murdered. Khanal’s team also shot notorious gangster Kumar Shrestha ‘Ghaite’ in an encounter in Kathmandu. In his leadership, the police raided educational consultancies on charges of fraud as well as arrested and filed cases against two government officials and petrol pump owners for black marketeering.